Diodes in their simplest form essentially allow current to flow in one direction while blocking current from flowing in the opposite direction. This basic function can be utilized in may ways, such as protecting other critical components from high voltage spikes, or regulating voltages in front of sensitive circuitry, or even generating light. 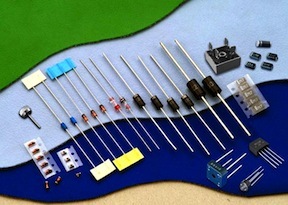 Many types of Diodes are available, including Zener Diodes, PIN Diodes, Light-Emitting Diodes (LEDs), Power Diodes, Laser Diodes, Transient Voltage Suppression (TVS) Diodes, Schottky Diodes and Photodiodes. Common applications for Diodes include circuit protection, consumer, industrial and automotive lighting applications, and as building blocks in circuit design to perform the function of switch or power conversion. Manufacturers of Diodes and Power Diodes include Vishay Intertechnology, International Rectifier, STMicroelectronics, Microsemi, Littelfuse, NXP Semiconductors and Skyworks Solutions. Procure International offers both current production and obsolete Diodes from most of the world’s manufacturers at very competitive prices and short lead times. Search for the Diodes you need using the Part Number Search bar at the top of this page, submit your RFQ to get pricing, and place your order directly online using our secure online ordering process.